Starting something that you’ve always wanted to do can be downright nerve-wracking. There are so many uncertainties. But facing those uncertainties can be exciting too. Thus, Halourd, Sweetie, and I were filled with a mix of trepidation and excitement as we prepared to climb Mt. 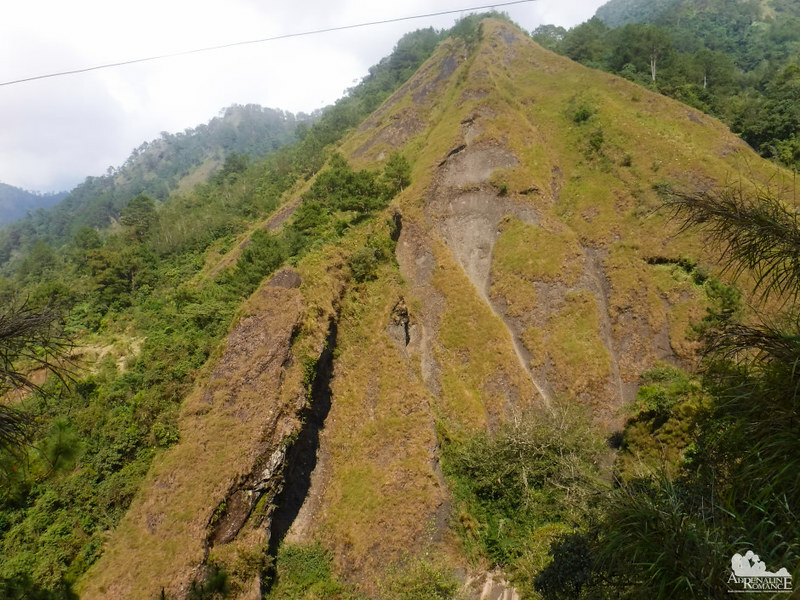 Patullok, commonly referred to as Mt. 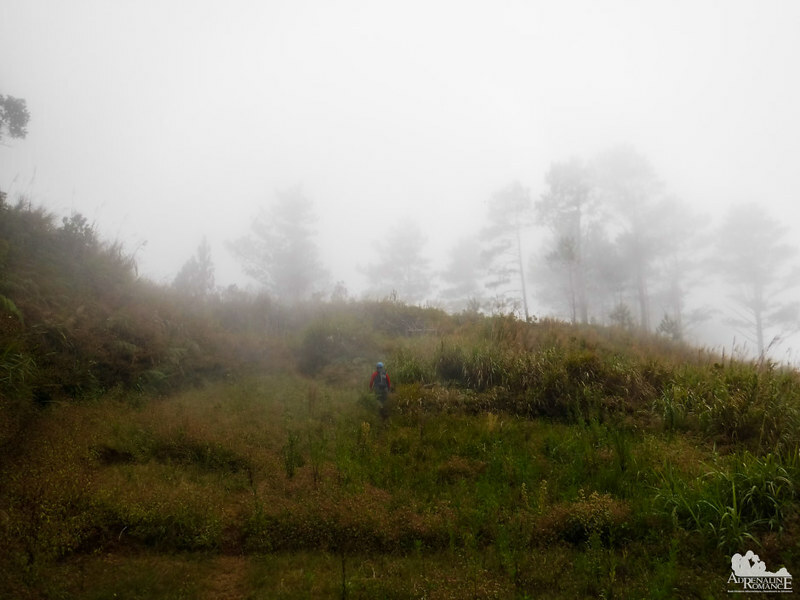 Lubo—the first of the Bakun trilogy in Benguet, Philippines. This is also the highest mountain of the three. Our home base for this 3-day adventure was this homestay constructed by the Bakun LGU. It’s a pretty nice home away from home complete with a kitchen, a dining room, and a bathroom. The bunks are located upstairs, and the room can accommodate five to six people comfortably. You might wonder why this structure has walls made of corrugated steel, which is a good conductor of heat. Won’t the steel make the interior unbearably hot? Well, for one thing, concrete is a rare commodity here. It requires a large degree of logistics to transport bulk amounts of concrete in this remote village. Two, an inner wall of wood and foam insulates the interior from the heat. We left the things we don’t need for this climb, locked the door, and took our first step of this dream adventure. That’s our local guide, waiting for us. The jump-off was a rather simple 5-minute walk up an old concrete road at the edge of the poblacion. We were out of protection from any artificial structure, and the only other sound aside from our voices was a soft, howling mountain breeze. 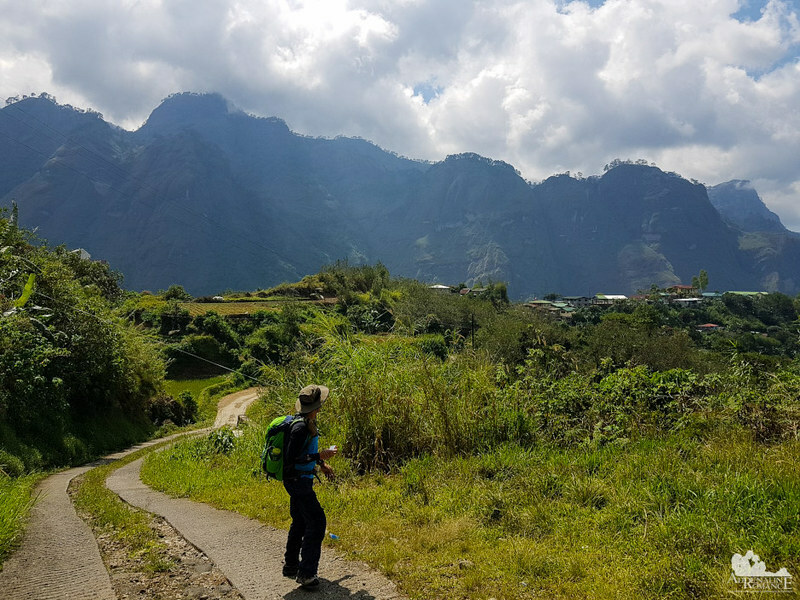 Out here in the wild, surrounded by the majestic Cordilleras, we felt absolutely minuscule. 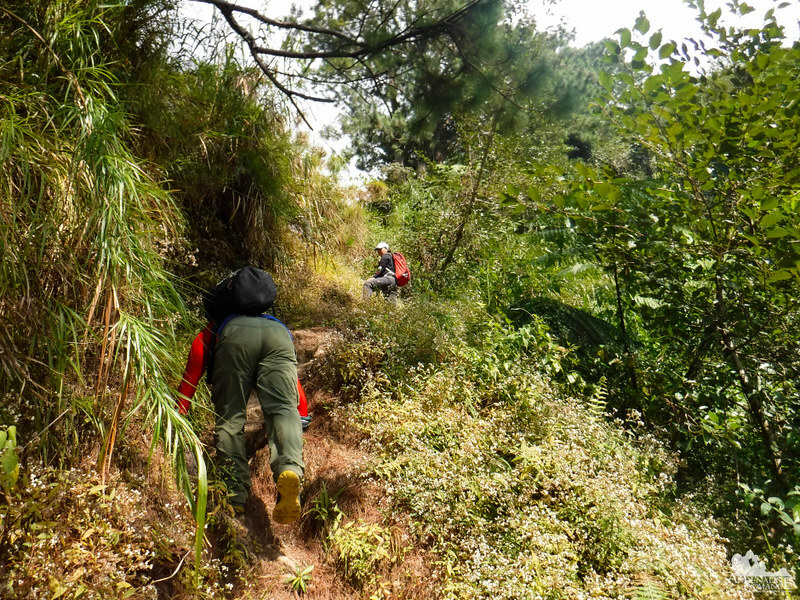 Soon, we left the road and entered a rough trail that immediately went up at a very sharp angle. Thank heavens we had practice climbs before we undertook this ordeal. Or else, we would have suffered leg cramps this early. Hahaha! Soon, we stopped to rest for a few minutes on a small level “deck” that overlooks the Bakun Poblacion and the surrounding peaks, which we will climb in a few days. We fell silent, admiring the grandness of this stunning place. The mountain range and the canyon between them stretched as far as our eyes can see. 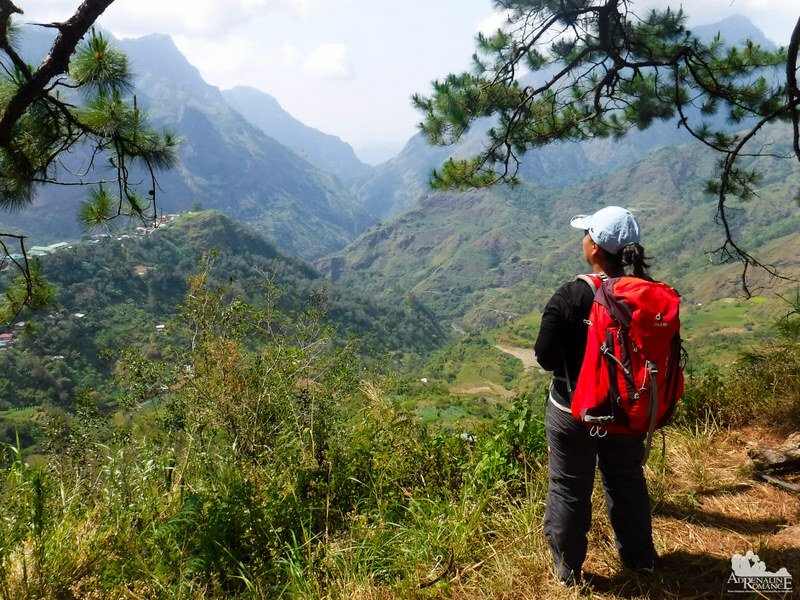 It’s bewildering to know that this seemingly endless area is just a tiny part of the province of Benguet. It just shows that there are so many things to explore in the Philippines. After a 5-minute rest, we continued on our way on a well-established trail. Apparently, locals regularly ply this trail although we did not see a single soul during our climb. We saw miles upon miles of water pipes along the trail. These connect to hidden springs and groundwater wells that act as water sources for the neighborhood. 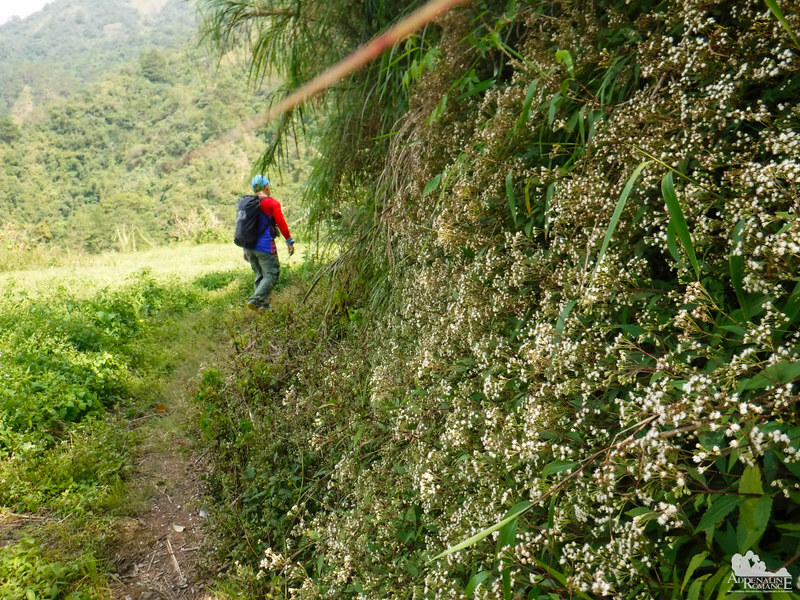 Small white wildflowers carpeted the trail and the rock walls. They look like walls and carpets of cotton and snow. These flowers are often used as accents for larger blossoms in bouquets. 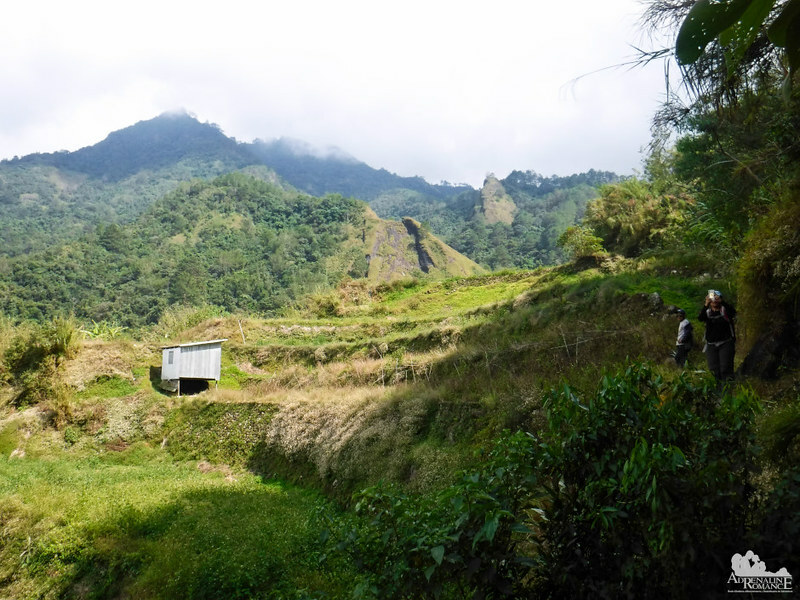 Contour farming, much like terracing, is an ancient farming method that is still practiced here in Bakun. This ancient farming technique refers to planting or plowing across a mountain slope, following the slope’s elevation contour lines. These contour lines create water breaks that prevent gullies from forming. Gullies are usually created during the rainy season, and the heavy water run-off causes soil erosion. Highly visible several miles from this farm in the middle of nowhere is the peak of Mt. Lubo, our goal for this afternoon. As we walked on the ascending trail, we came upon this huge rock promontory right across us. We’re not exactly sure, but we believe it’s NOT made of limestone. If one slips down from the top of that promontory, there’s nothing that can stop his way down. The surface of the slopes is just too smooth. Half of the way to the summit of Mt. 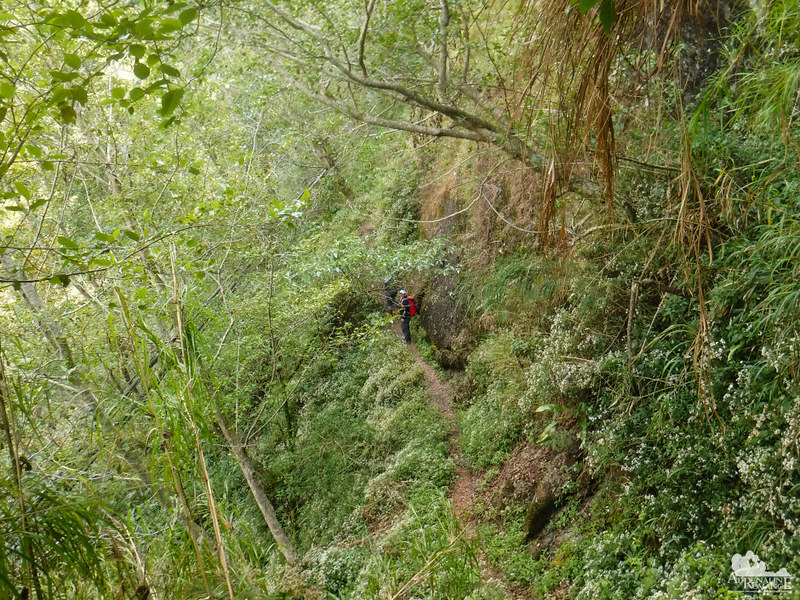 Lubo involved walking along a narrow trail that hugs a steep slope. The foliage became thicker, which is always a great thing. The forest canopy acts as a giant umbrella, protecting us from the afternoon’s searing heat. 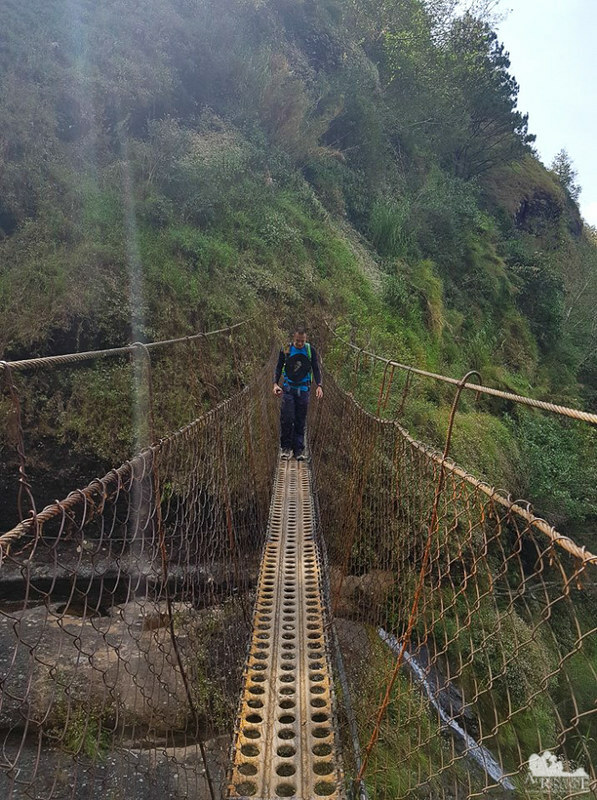 One of the most exciting—and heart-pounding—moments in this trek was crossing this rickety hanging steel bridge. While it does look sturdy, we still got the hibbie-jibbies as each step makes the thin bridge sway. While the guide assured us that it is a tough bridge, the huge splotches of rust all over the structure made us hesitate with each step. 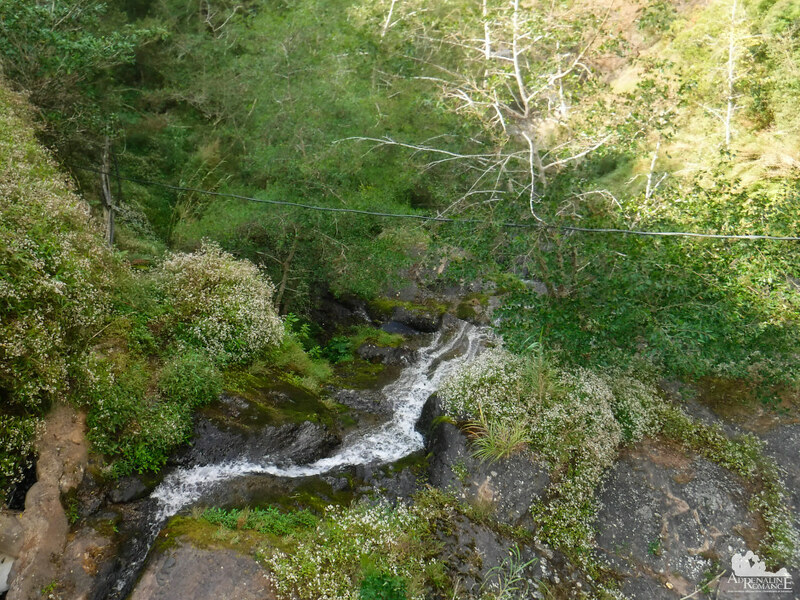 If the bridge somehow fails (knocks on wood), we would definitely plunge hundreds of feet below into the rocky, mossy, slippery riverbed below. We doubt if anyone can survive this fall. Hahahaha! But despite the perceived danger, the scenery from the bridge is nothing short of spectacular. The deep canyon below and the lofty Mt. Tenglawan beyond us—the vista is just so humbling. We fervently wish people would do an adventure like this at least once in their lives. The feeling of being so small and insignificant in the face of Mother Nature is life-changing. We have learned so many important lessons by visiting places like this. As if a rickety, swaying steel bridge and a constantly ascending trail were not enough to make our heartbeat race into a staccato, we had to cross flimsy, possibly rotting wooden planks like these. It would be fine if the fall isn’t deep. Unfortunately, like chutes, those narrow crevices are narrow, slippery, and lead way down through the lip of a cliff. 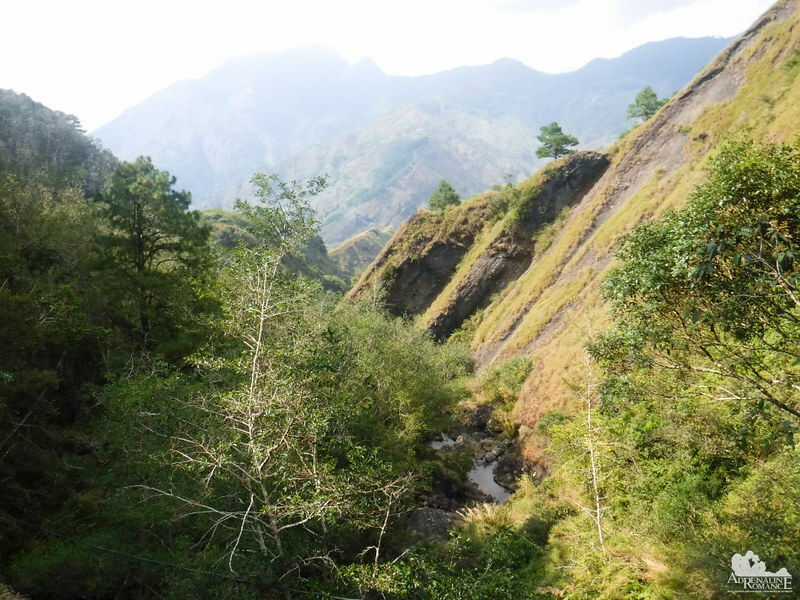 Pine trees dominate the mountains and forests in the Cordilleras. Pines are some of the most longest-lived trees in the world. 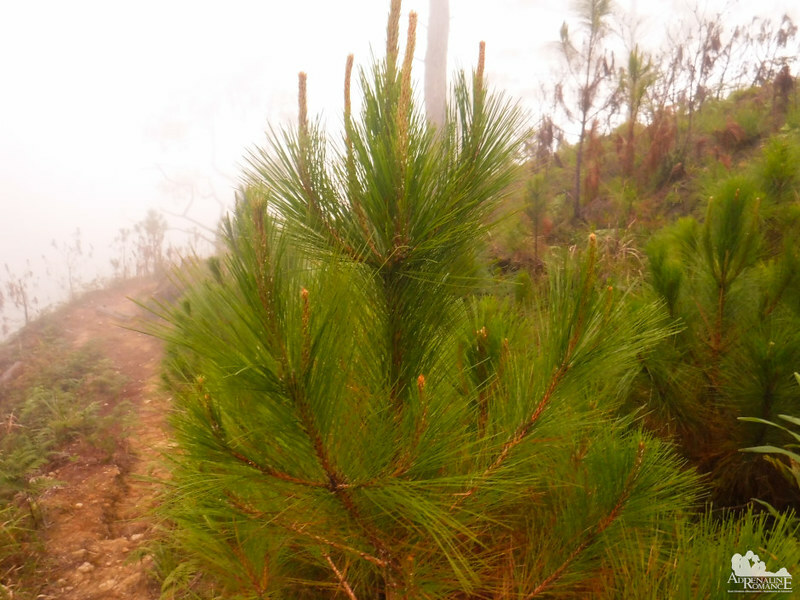 Typically, a healthy pine tree can live for 100 to 1,000 years! The forest floor was covered with dead and wilted pine needles, barks, and cones. The soft ground made the trail friendly to the feet, a pleasure to walk on. 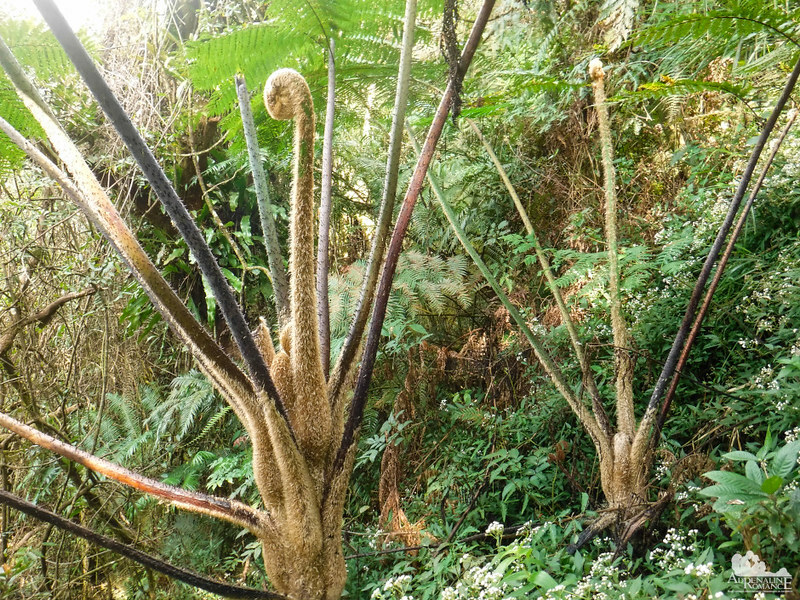 What are these weird plants? Are we still on earth? They look like those strange plants from Avatar! If they glow during the night, we would really be convinced we are in Pandora instead of Earth. 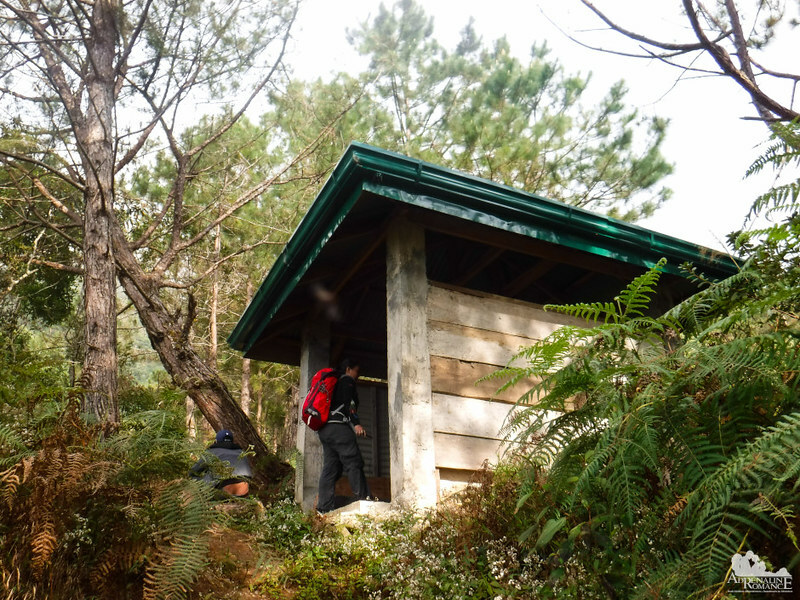 Midway through the hike, we came across this man-made shed in the middle of nowhere. What a welcome sight! We took off our Deuter backpacks and rested here for a while, drinking gulps of Gatorade and eating some of our GORPS (a kind of trail snack made of nuts, raisins, gummies, and chocolate) to replenish our energy. 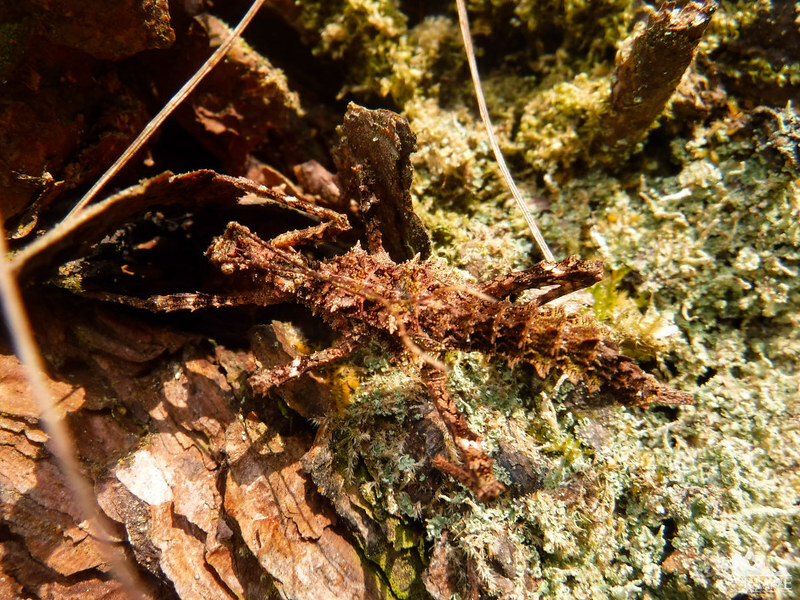 While resting, we found this perfectly camouflaged insect on the bark of the pine tree nearest to us. The wilderness is a hostile place, and the organisms that live here have adapted all sorts of ingenious ways to hunt for prey or protect themselves from predators. With our ions and minerals salts replenished, we continued on our way. We soon left the pine forest and entered a mossy jungle of twisted trees. Suddenly, we reminisced our climb up Mt. 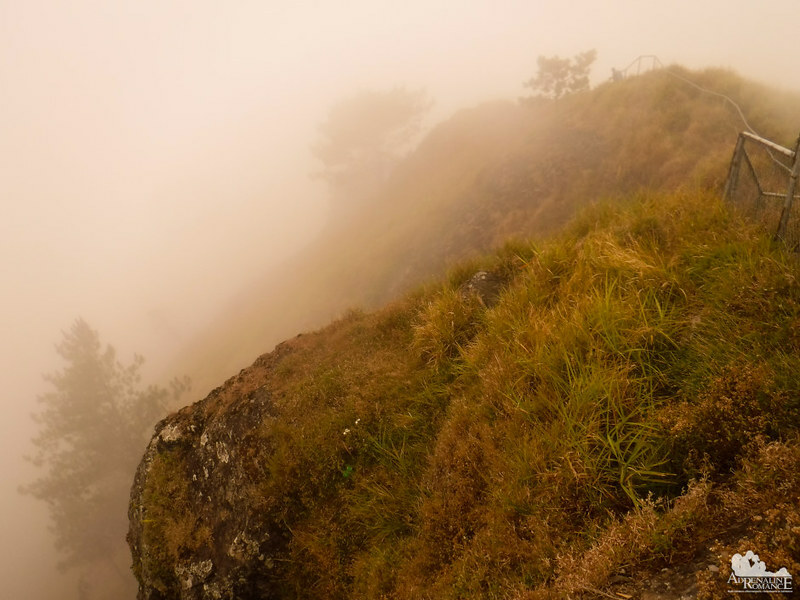 Pulag via the scenic Akiki Trail where pine and mossy forests cover the majority of the way. The thick forest canopy filtered the gradually waning afternoon light, giving it the atmosphere of a witch’s forest. We felt like Hansels and Gretel trying to find their way home. 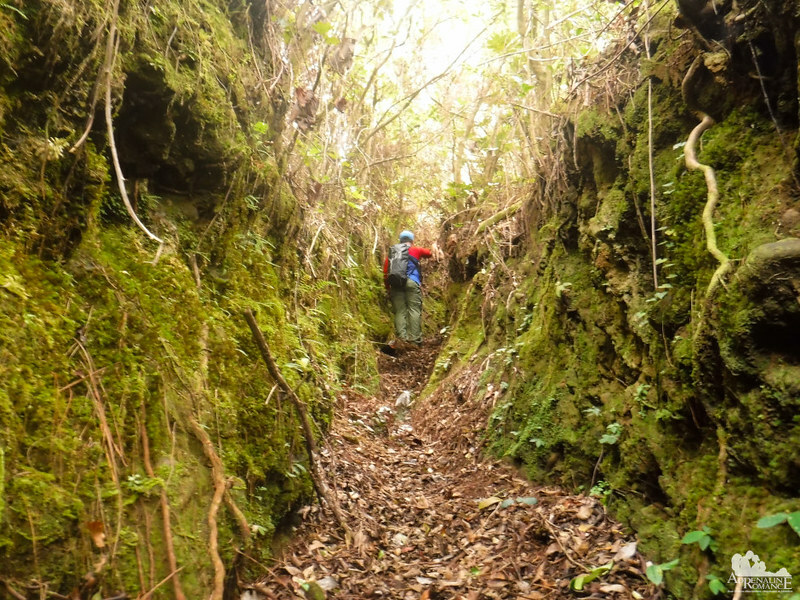 To save a bit of time, our guide decided to take a shortcut through this long, mossy, and dark canyon. A strange sight. 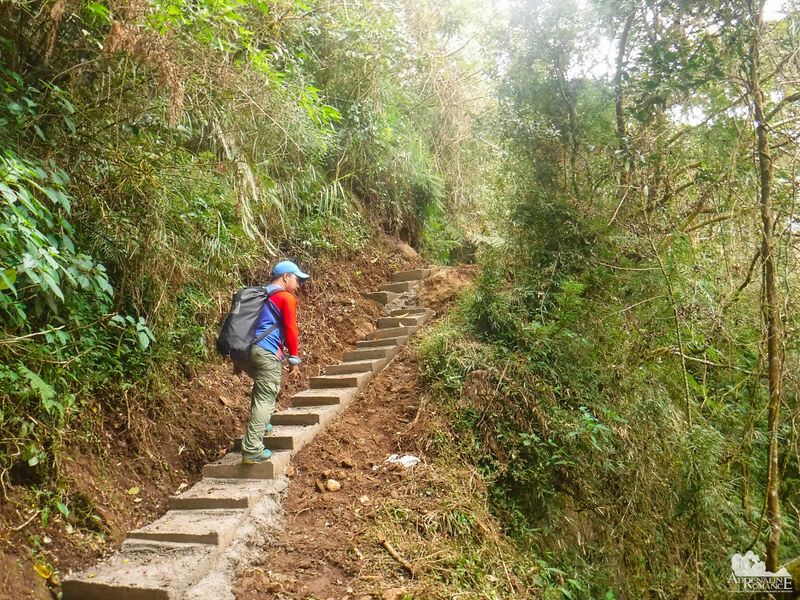 We were deep in the jungle, yet suddenly, concrete steps took place on the soft trail. Yeah, it’s ugly. Our guide said that they had to pave this part of the trail because, during heavy rain, the mud becomes thick and slippery. The thick mud makes the trail somewhat impassable and relatively dangerous; there’s a steep slope on the other side. Thankfully, the concreted path only goes a few hundred. We emerged through a vast, hilly grassland dotted here and there with groves of pine trees. We had another short break while Halourd tested his Mavic Air. Unfortunately, we’ve reached the base of the clouds, and everything was covered with a thick, wet mist. 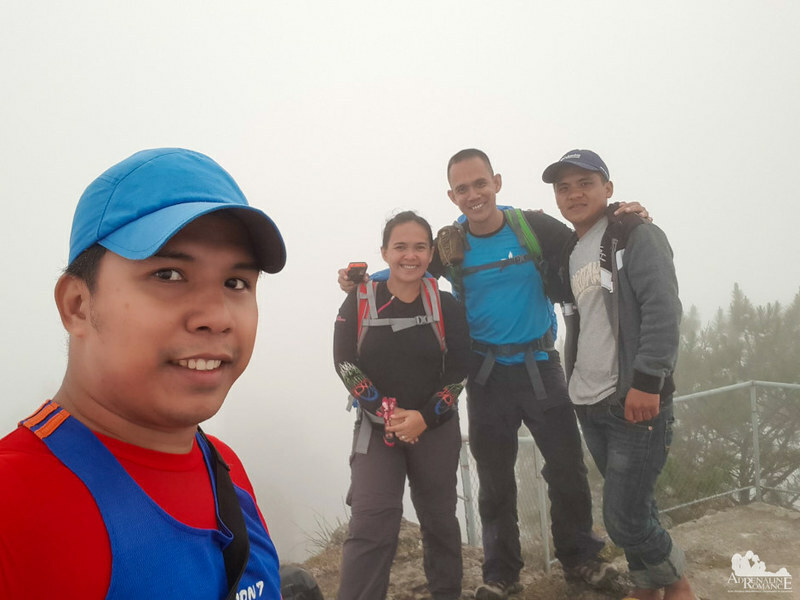 We hoped that the clouds will clear up once we get to the summit. But apparently, the afternoon’s rapidly dropping temperature didn’t lift the fog up. We walked in a gray, translucent world, the faint outline of pine trees watching over us. 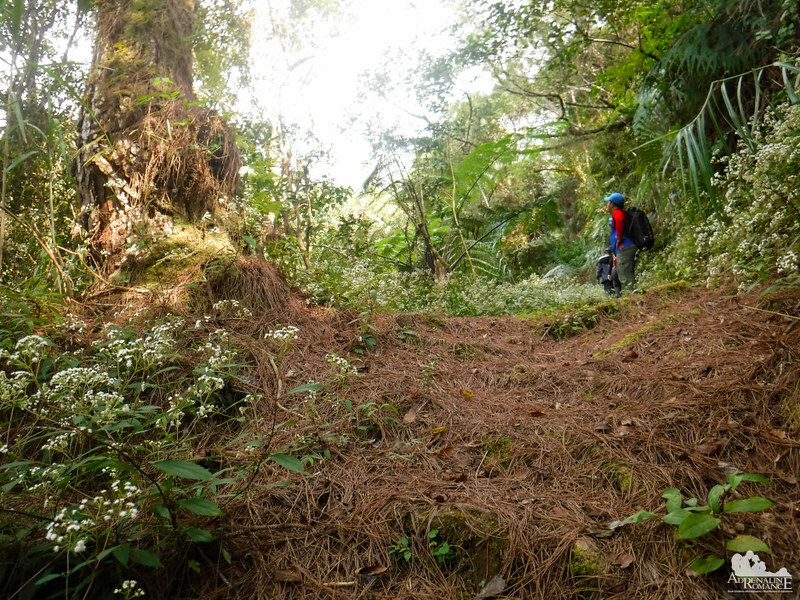 Although the existence of Yamashita’s gold is dismissed by most archeologists and historians, its tale still attracts treasure hunters even today. Yamashita’s gold is allegedly a war loot stolen by Japanese forces during World War 2. They supposedly buried the loot underground somewhere in the country. For over half a century, treasure hunters near and far have been looking for this near-mythical treasure. 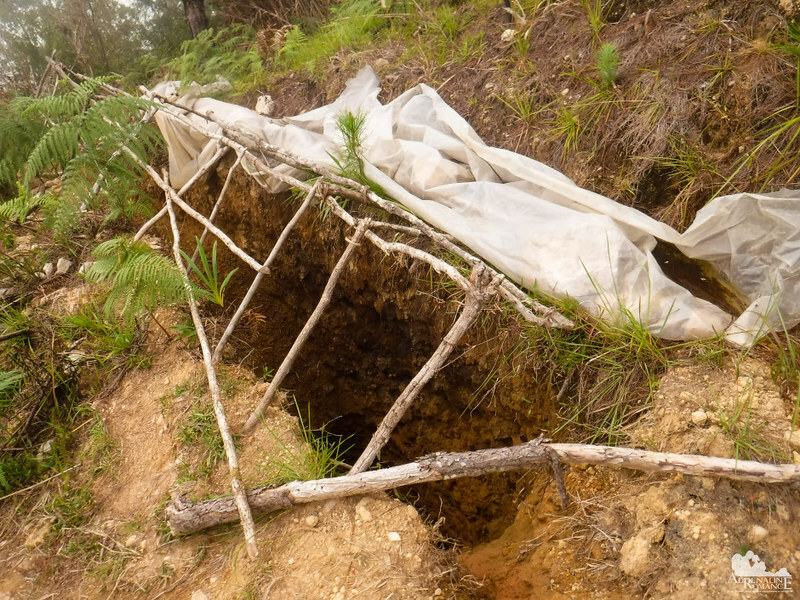 Our guide said locals dug this hole because they believe that this is a possible resting place—one among the thousands of alleged sites—of Yamashita’s Gold. One more stretch! We arrived at the entrance of Mt. Lubo’s summit (formal name is Mt. Patullok). 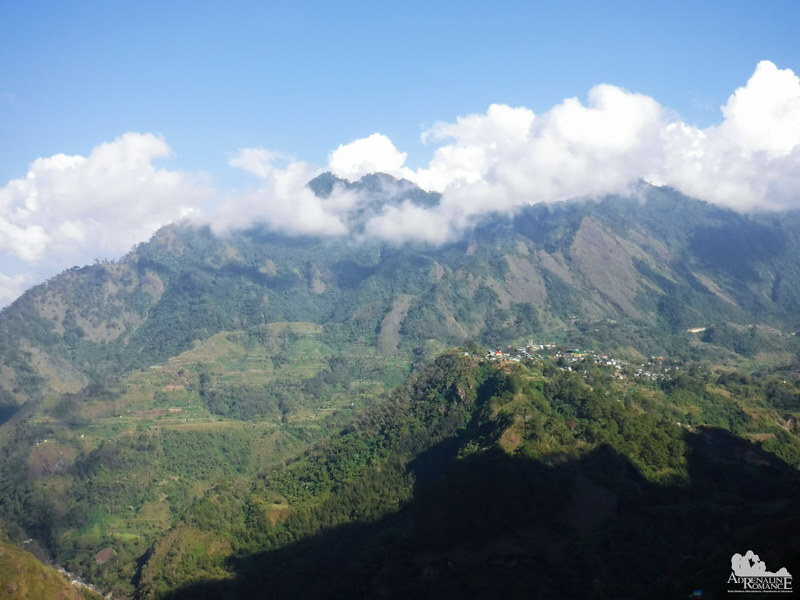 The LGU installed a locked gate here to prevent unruly locals from vandalizing the summit. In addition to the gate, a safety fence is installed on the inclined knife-edge ridge that leads to the summit. That’s because there is a huge vertical drop on either side of the knife edge. 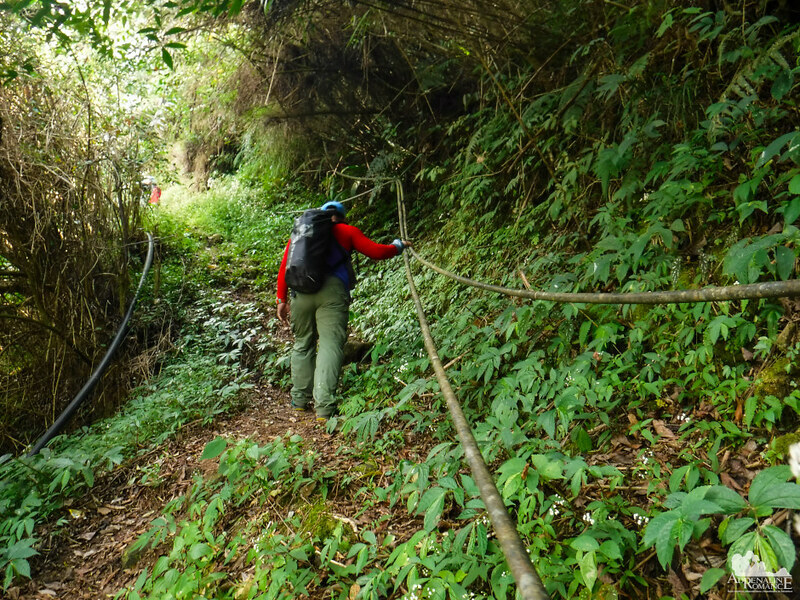 And with the loose soil and rocky terrain, the trail can be very slippery—and hazardous, especially during wet season. Around 5:00 PM, three hours after we started our ascent, we stood on top of Mt. 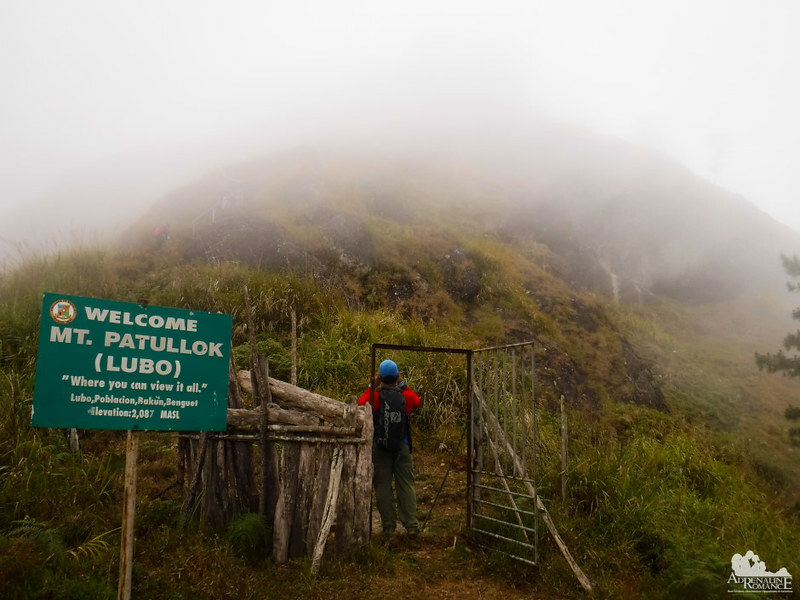 Lubo at 2,087 MASL. Our pace was moderate, but we didn’t have a lot of stops. Furthermore, our rests only averaged around five minutes. We were hoping the afternoon would get warmer so the clouds would lift up and we could “view it all.” But while we munched some oranges and the last of our trail snacks, the omnipresent fog was as heavy as ever. There’s nothing to see except a monotonous shade of gray. With a clear sky, we believe the view here would be absolutely awesome. Well, such are the vagaries and uncertainties of outdoor adventures. Mother Nature is unpredictable, and we have learned to accept and appreciate her gifts, no matter her temperament. After spending more than half an hour on the summit, we started our way back. 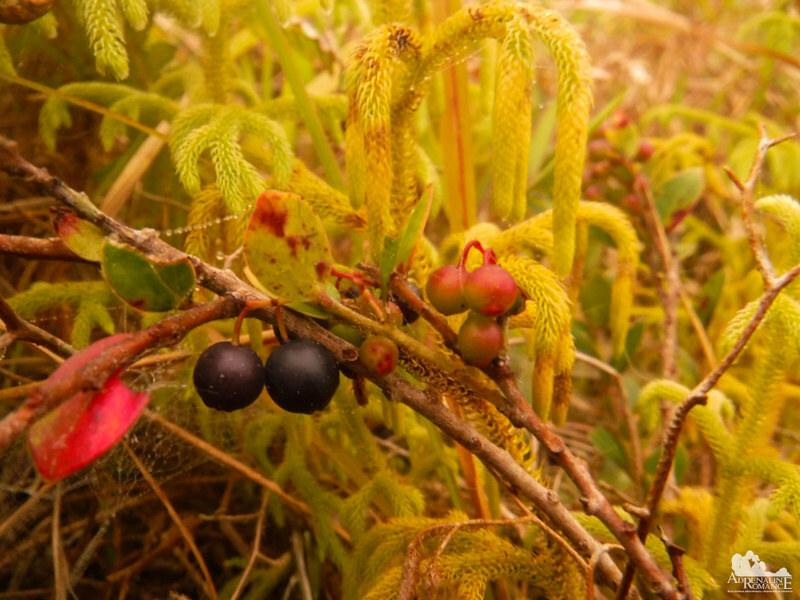 We snacked on these berries sweet-sour berries that we found in large clumps. Don’t worry, they’re not poisonous, according to our guide. Well, we believe him—he munched a lot of those berries! Hahaha! Pygmy pines! Soon, they will become mama and papa trees that will add cover to this already beautiful forest! Hehehe! It was dark when we finally saw the few faint, flickering lights of the Bakun Poblacion. Despite our excitement for a hot dinner and a well-deserved rest after a successful climb, we slowed down our descent and took extra care. 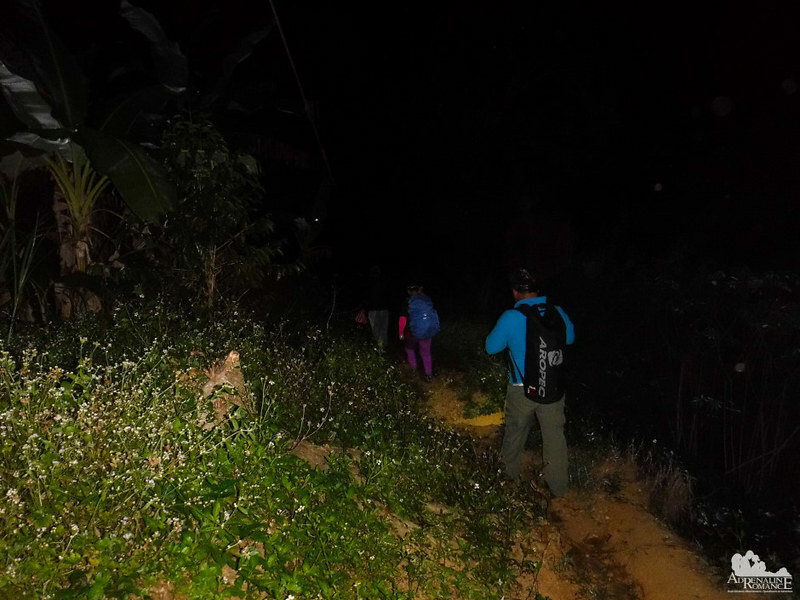 We know there are deep ridges, slippery roots, and sharp rocks as we backtracked our way back to the village, so we need to be extra careful. There is always a change of mindset on the descent stage. Climbers become more relaxed and carefree, knowing that they are on their way home. And this is when accidents are most likely to happen. Finally, at 8 PM, six hours after we climbed Mt. Lubo, we finally arrived at the comfort of our homestay. We celebrated simply with an ice-cold Coke, adobo, a bit of some Spam, and a side of braised veggies. As we covered ourselves with warm blankets to protect ourselves from the chill of the night, we contemplated on our first adventure. That was a great climb and a really nice warm-up. Mt. Lubo’s spirit guardian must have put a cloudy cape on us, but that’s okay. We have accomplished the first of the Bakun trilogy, but there are still two way more difficult challenges. Can we make it up the second mountain? Stay tuned! For transportation-related rates, click our Bakun Triology Teaser. 2. The trek to the campsite and summit is quite steep with a few level areas here and there. 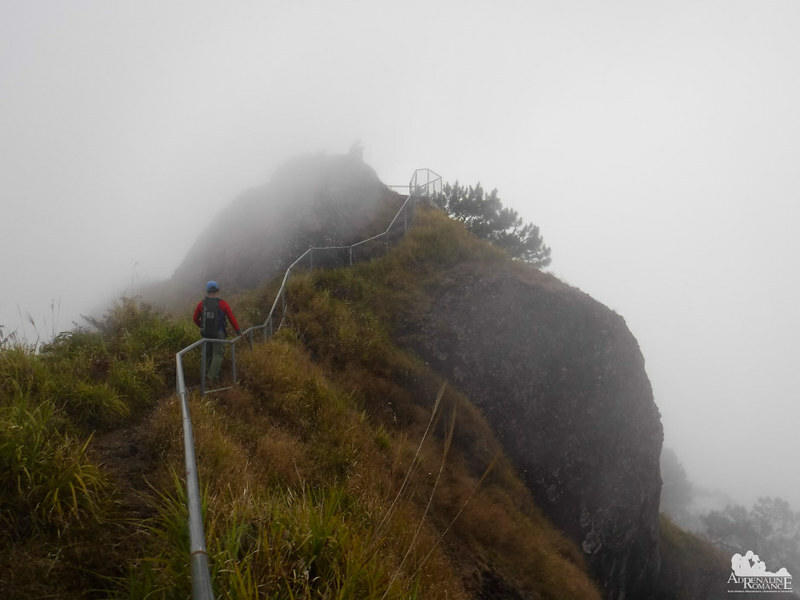 Be extra careful when climbing on ridges or beside steep slopes. 3. Wear arm guards and trekking pants to protect your skin from the sun and prickly plants. Also, a dry-fit shirt or rash guard will help keep you cool. 4. Wear trekking shoes or sandals with an aggressive tread. You will need a lot of traction since you will be scrambling over loose soil, loam, and slippery rocks . 5. 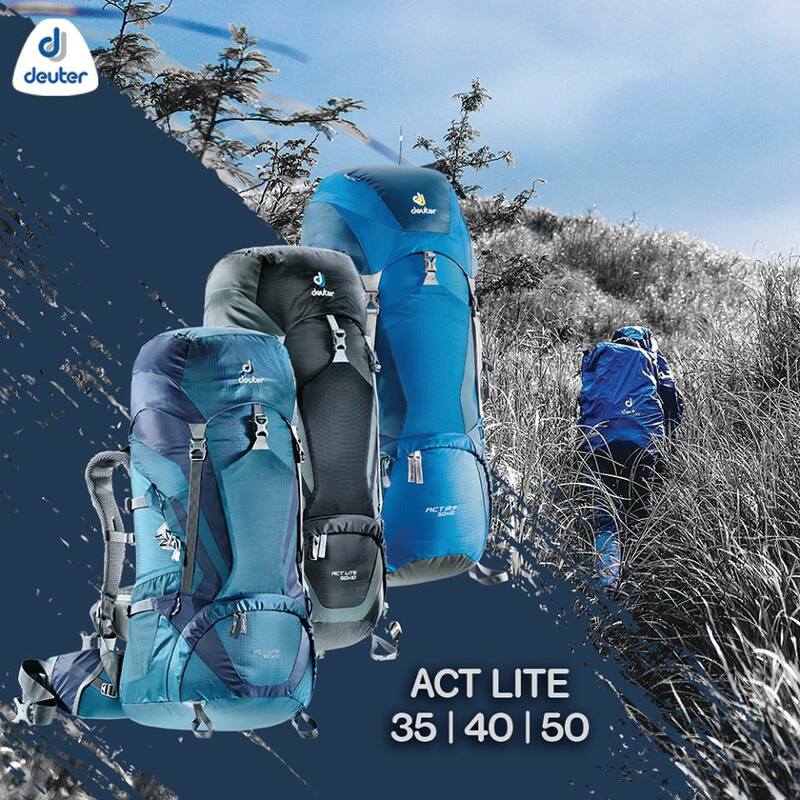 Bring a lot of water because there is no reliable water source anywhere during the ascent. 6. Bring salt tablets or ion-filled beverages such as Gatorade, coconut water, or fruit juice aside from water. The hot sun, multiple ascents, and exposed trails can make you sweat a lot. When you lose enough ions and salts via your sweat, cramps will occur. If cramps happen, rest for awhile, drink a lot of water or ionic drinks. This will replenish the ions in your system. 9. Don’t forget to waterproof your belongings. You can do this easily by wrapping your stuff inside dry sacks or dry bags. 10. Please mind your trash; do not leave any of your garbage behind. Wow! What a lovely trek. Thank you! It was a nice warm-up. It would have been better if there was a clearing at the summit. Unfortunately, the low-lying clouds obscured everything. You are so brave. Spending time with Nature is always the best. Well, we wouldn’t call ourselves brave. We believe that is too strong a word coz we do have our fears whenever we go adventuring. But we do what we have to do and hope for the best. That’s why we always make sure we prepare for each adventure the best we can. WOW! Such an adventure!! That bridge freaked me out though! must have been pretty frightening! wow what a stunning place! I have never stayed in a homestay, would be very interesting! A homestay is fun…it’s like staying in someone else’s house. 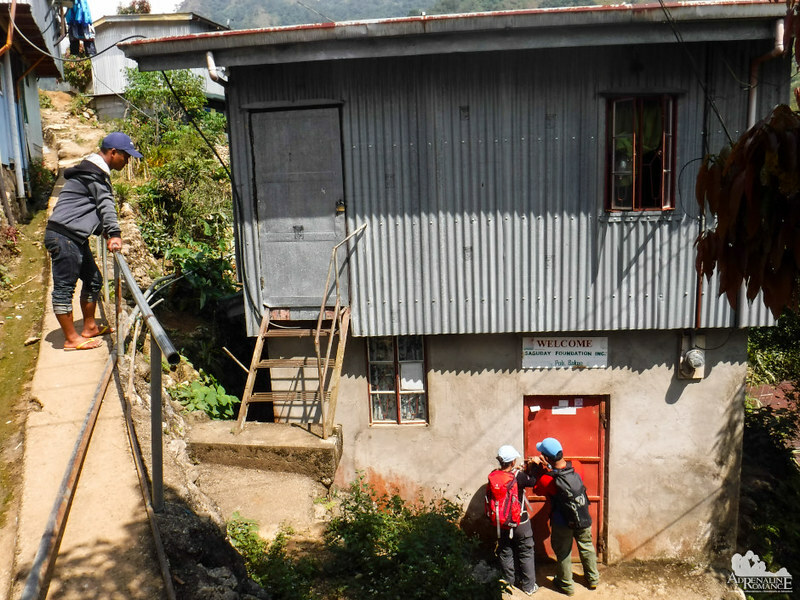 During our trips, our first option is always a homestay. It’s affordable and it doesn’t have that business-like atmosphere in hotels. I can imagine that a climb like that would be nerve-wracking! I don’t think I could ever do anything like that, I’d probably manage to hurt myself lol. Indeed! It would have been better if the fog wasn’t so thick. The guide said the view from up there is amazing during a clear day. Nice Post! Beautiful pictures you captured on your travel trip. You shared the amazing experience of your trip. it’s really enjoyable. Thanks for sharing this post. I think that I could handle a 3 hour hike starting in the middle of the afternoon! These kind of treks seem to always be 8 hours of hiking starting at 3:00 am or something so this is a refreshing suggestion. It looks manageable and I like all the suggestions and tips you provided at the end. Definitely! The entire adventure can be finished in 6 hours or less. And an afternoon hike is cool too, especially if it’s not blazing hot. What an awesome experience. So many gorgeous views… It really does like otherworldly. A very helpful post too, thanks for sharing. Well, don’t worry…the trail does not go to that promontory. It’s just across a huge chasm. 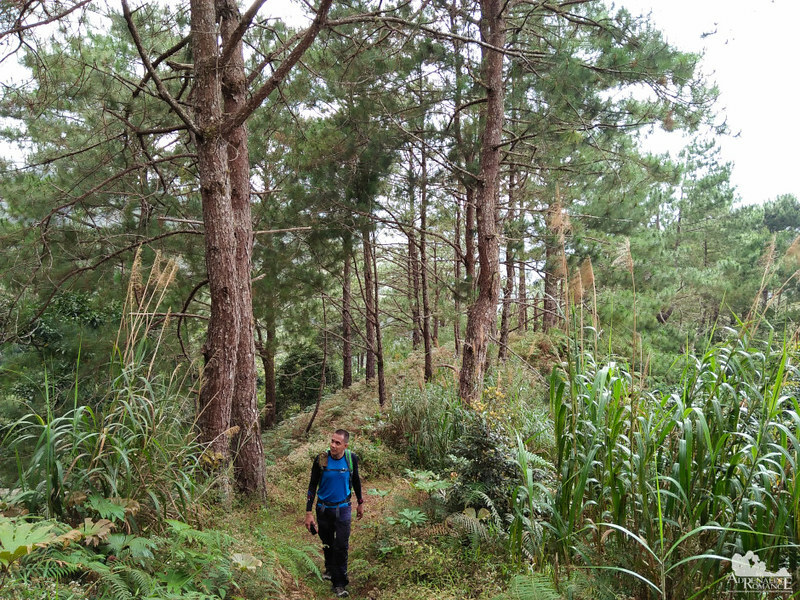 Pine trees are common in the Cordilleras, Mountain Province, and highlands of Luzon. 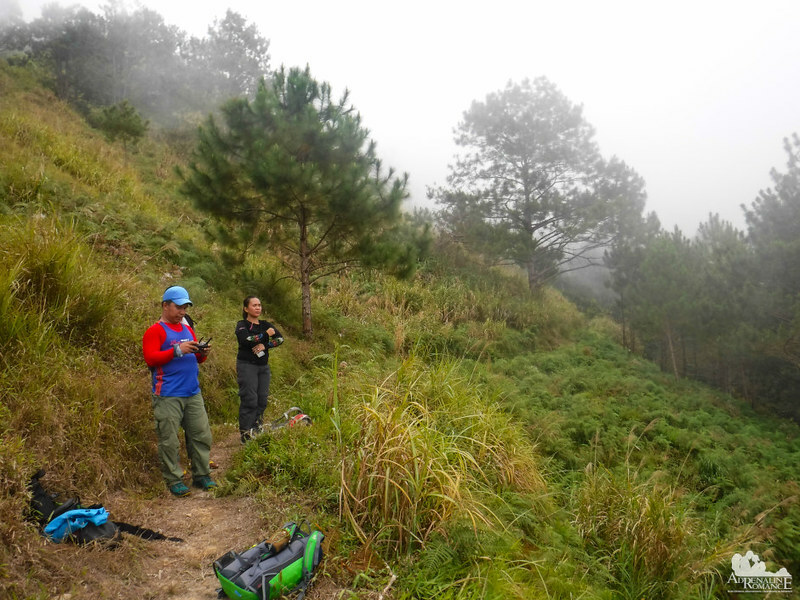 We also had the same thought; we thought we don’t have pine trees until we visited these mountains of Luzon. That does look like a very difficult hike. 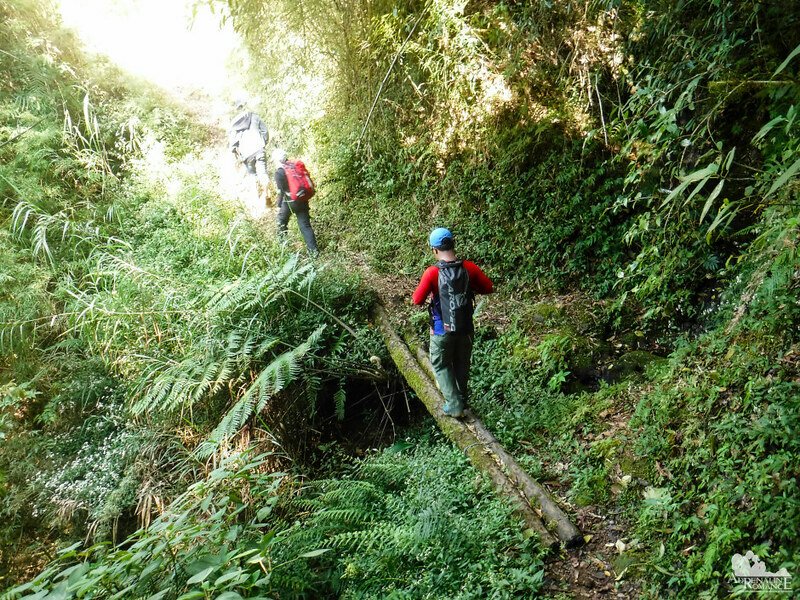 And that rickety bridge, I am not sure I would have had the courage to cross it. But of course, the view is totally worth it. And I love the Pandora plants. So unique! It’s not really super difficult, but it is challenging. Crossing those hanging bridges though is a little—hibby-jibby. Hahaha! 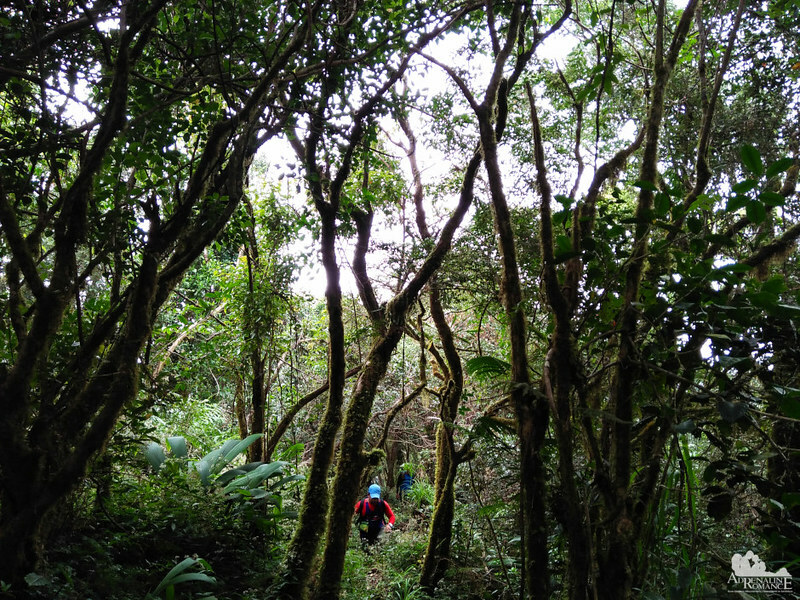 This trekking trail looks absolutely stunning and how beautiful is it that the terrain changed as you guys proceeded! While reading we were waiting to see the view from the summit but that was such a bummer that it was all foggy that evening! Yup! The trail was nice, although it was constantly ascending. Well, that’s a good challenge—and a good workout as well. That’s a nice track. I would love to get there with my camera. and photograph everything. Taking pictures of people at nature is one of my favorites. Oh yes! It’s actually very scenic. And we believe the view from the top would be stunning if it were not for the fog. What an adventurous experience! I’ve never heard of this before but glad for this informative post. Really enjoyed all the photography that was included.